The Lost Detective: Becoming Dashiell Hammett, Nathan Ward, Bloomsbury Publishing, 216 pp., end notes, illustrations, 2015, $31.00. Before he became a household name in America as perhaps our greatest hard-boiled crime writer, before his attachment to Lillian Hellman and blacklisting during the McCarthy era, and his subsequent downward spiral, Dashiell Hammett led a life of action. Born in 1894 into a poor Maryland family, Hammett left school at fourteen and held several jobs before joining the Pinkerton National Detective Agency as an operative in 1915 and, with time off in 1918 to serve at the end of World War I, he remained with the agency until 1922, participating alike in the banal and dramatic action of an operative. The tuberculosis he contracted during the war forced him to leave the Pinkertons--but it may well have prompted one of America's most acclaimed writing careers. While Hammett's life on center stage has been well-documented, the question of how he got there has not. That largely overlooked phase is the subject of Nathan Ward's enthralling The Lost Detective. Hammett's childhood, his life in San Francisco, and especially his experience as a detective deeply informed his writing and his characters, from the nameless Continental Op, hero of his stories and early novels, to Sam Spade and Nick Charles. The success of his many stories in the pulp magazine Black Mask following his departure from the Pinkertons led him to novels; he would write five between 1929 and 1934, two of them (The Maltese Falcon and The Thin Man) now American classics. Though he inspired generations of writers, from Raymond Chandler to Michael Connelly and all in between, after The Thin Man he never finished another book, a painful silence for his devoted readers; and his popular image has long been shaped by the remembrance of Hellman, who knew him after his literary reputation had been made. Based on original research across the country, The Lost Detective is the first book to illuminate Hammett's transformation from real detective to great American detective writer, throwing brilliant new light on one of America's most celebrated and remembered novelists and his world. Before he became a household name in America as perhaps our greatest hard-boiled crime writer, before his attachment to Lillian Hellman and blacklisting during the McCarthy era, and his subsequent downward spiral, Dashiell Hammett led a life of action. Born in 1894 into a poor Maryland family, Hammett left school at fourteen and held several jobs before joining the Pinkerton National Detective Agency as an operative in 1915 and, with time off in 1918 to serve at the end of World War I, he remained with the agency until 1922, participating alike in the banal and dramatic action of an operative. The tuberculosis he contracted during the war forced him to leave the Pinkertons--but it may well have prompted one of America's most acclaimed writing careers. CWL: How did Sam Hammett move from being a Pinkerton detective to writing detective novels? Did being a Pinkerton detective make him a better writer? Ward states that Hammett had the talent to write fiction, poetry and advertising copy but what gave him is narrative style was his work writing reports for the detective agency. The 'Eye That Never Sleeps' also provided Hammett with a cast of indelible characters which he honed and broadened. Ward spent a great deal time in the Library of Congress reading the reports of Pinkerton agents and finds a style of writing that is both 'just the facts' and highly descriptive of criminal environments and situations. A high school dropout and U.S. army ambulance driver who acquired tuberculosis, Hammett joined the agency at an entry level and he worked to overcome poverty and keep his wife and children under the same roof. The detective magazine market provided a small income while recovery from bouts of TB and while he developed his unique narrative style and voice. Hammett wrote what he knew: San Francisco and investigations. Along with hours he spent in the Library of Congress, Ward mined local San Fransisco literary historians and Hammett researchers. 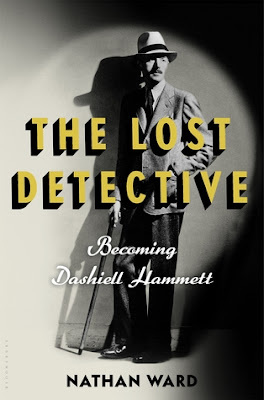 The Lost Detective: Becoming Dashiell Hammett is a brief biography, full of anecdotes, travels and a glimpse of the American 1920s and 1930 popular culture of literature and film. Ward's narrative style is accessible to most readers who a bring to the book a general knowledge of Hammett's career and impact on literature. 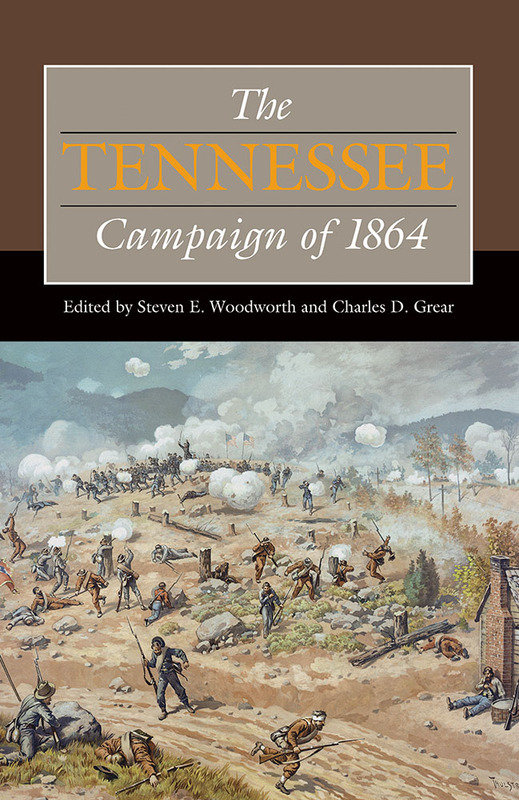 The Tennessee Campaign of 1864, edited by Steven E. Woodworth and Charles D. Grear, 296 pp., 14 illustrations, $34.50. January or February 2016. From The Publisher: Few American Civil War operations matched the controversy, intensity, and bloodshed of Confederate general John Bell Hood’s ill-fated 1864 campaign against Union forces in Tennessee. 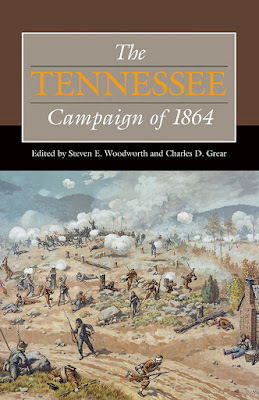 In the first-ever anthology on the subject, The Tennessee Campaign of 1864, edited by Steven E. Woodworth and Charles D. Grear, fourteen prominent historians and emerging scholars examine the three-month operation, covering the battles of Allatoona, Spring Hill, and Franklin, as well as the decimation of Hood’s army at Nashville. The volume’s contributors explore the campaign’s battlefield action, including how Major General Andrew J. Smith’s three aggressive divisions of the Army of Tennessee became the most successful Federal unit at Nashville, how vastly outnumbered Union troops held the Allatoona Pass, why Hood failed at Spring Hill and how the event has been perceived, and why so many of the Army of Tennessee’s officer corps died at the Battle of Franklin, where the Confederacy suffered a disastrous blow. An exciting inclusion is the diary of Confederate major general Patrick R. Cleburne, which covers the first phase of the campaign. Essays on the strained relationship between Ulysses S. Grant and George H. Thomas and on Thomas’s approach to warfare reveal much about the personalities involved, and chapters about civilians in the campaign’s path and those miles away show how the war affected people not involved in the fighting. An innovative case study of the fighting at Franklin investigates the emotional and psychological impact of killing on the battlefield, and other implications of the campaign include how the courageous actions of the U.S. Colored Troops at Nashville made a lasting impact on the African American community and how preservation efforts met with differing results at Franklin and Nashville. Canvassing both military and social history, this well-researched volume offers new, illuminating perspectives while furthering long-running debates on more familiar topics. These in-depth essays provide an insider’s view of one of the most brutal and notorious campaigns in Civil War history. Steven E. Woodworth is a professor of history at Texas Christian University. He is the author or editor of thirty-one books about the Civil War, including This Great Struggle: America’s Civil War; Nothing but Victory: The Army of the Tennessee, 1861–1865; and Jefferson Davis and His Generals: The Failure of Confederate Command in the West. He is a coeditor of the Civil War Campaigns in the Heartland series. Charles D. Grear is a professor of history and the online manager for history and geography at Central Texas College. A specialist on Texas and the Civil War, he is the author, coauthor, or editor of six books, including The Chattanooga Campaign, Why Texans Fought in the Civil War, and The House Divided: America in the Era of the Civil War. He is a coeditor of the Civil War Campaigns in the Heartland series. Contributors include Stewart Bennett, Andrew S. Bledsoe, John J. Gaines, John R. Lundberg, Jennifer M. Murray, Paul L. Schmelzer, Brooks D. Simpson, Timothy B. Smith, Scott L. Stabler, Jonathan M. Steplyk, D. L. Turner, and William Lee White. 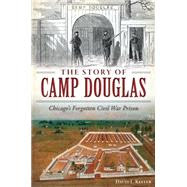 The Story of Camp Douglas: Chicago's Forgotten Civil War Prison, David L. Keller,History Press, 2015, 258 pp, profusely illustrated with b/w images, end notes, bibliography, index, $21.95. From the Publisher: More Confederate soldiers died in Chicago's Camp Douglas than on any Civil War battlefield. Originally constructed in 1861 to train forty thousand Union soldiers from the northern third of Illinois, it was converted to a prison camp in 1862. Nearly thirty thousand Confederate prisoners were housed there until it was shut down in 1865. Today, the history of the camp ranges from unknown to deeply misunderstood. David Keller offers a modern perspective of Camp Douglas and a key piece of scholarship in reckoning with the legacy of other military prisons. About the author: David Keller founded the Camp Douglas Restoration Foundation in 2010 and has been involved in the education on and recognition of Camp Douglas for many years. Retired from the banking industry, he has been a prolific writer and speaker on both the banking industry and his second passion, soccer refereeing. He is a docent at the Chicago History Museum and a popular speaker on Camp Douglas and the Civil War. The Camp Douglas Restoration Foundation has conducted four archaeological excavations on the site of Camp Douglas and has a major objective to develop and operate a museum on the site. He and his wife are long time residents of Chicago. 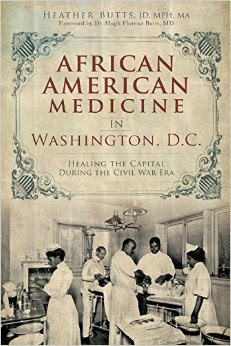 African American Medicine in Washington, D.C.: Healing The Capital During The Civil War Era, Heather Mutts, History Press, 2014, b/w illustrations, end notes, bibliography, index, $19.99. From The Publisher: The service of African Americans in defense of the Union during the Civil War required African American nurses, doctors and surgeons to heal those soldiers. In the nation’s capital, these brave health care workers created a medical infrastructure for African Americans by African Americans. Preeminent surgeon Alexander T. Augusta fought discrimination, visited President Lincoln, testified before Congress and aided the war effort. Washington’s Freedmen’s Hospital was formed to serve the District’s growing free African American population, eventually becoming the Howard University Medical Center. These physicians would form the National Medical Association, the largest and oldest organization representing African American doctors and patients. Author Heather M. Butts recounts the heroic lives and work of Washington’s African American medical community during the Civil War. About the Author: Heather Butts is an instructor of bioethics and public health law at Columbia University and adjunct professor at Saint John's School of Law. At Columbia University she has served on the institutional review board. She received degrees from Princeton University, Saint John's University School of Law, a master's degree from Harvard University's School of Public Health. She is the author of Alexander Thomas Augusta: Physician, Teacher and Human Rights Activist. Empty Sleeves: Amputation In The Civil War South, Brian Craig Miller, University of Georgia Press, 280pp, 20 b/w illustrations, endnotes, bibliography, index, $29.95. From The Publisher: The Civil War acted like a battering ram on human beings, shattering both flesh and psyche of thousands of soldiers. Despite popular perception that doctors recklessly erred on the side of amputation, surgeons labored mightily to adjust to the medical quagmire of war. 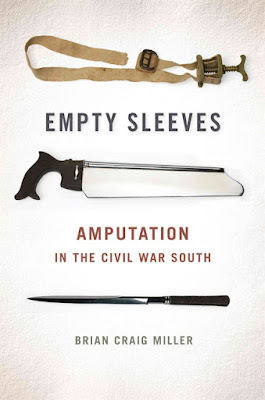 Brian Craig Miller shows in Empty Sleeves, the hospital emerged as the first arena where southerners faced the stark reality of what amputation would mean for men and women and their respective positions in southern society after the war. Thus, southern women, through nursing and benevolent care, prepared men for the challenges of returning home defeated and disabled. Still, amputation was a stark fact for many soldiers. On their return, southern amputees remained dependent on their spouses, peers, and dilapidated state governments to reconstruct their shattered manhood and meet the challenges brought on by their newfound disabilities. It was in this context that Confederate patients based their medical care decisions on how comrades, families, and society would view the empty sleeve. Brian Craig Miller is an Associate Professor and Associate Chair of History at Emporia State University and the forthcoming editor of the journal Civil War History. Miller is the author of John Bell Hood and the Fight for Civil War Memory (Univ. of TN Press, 2010) and A Punishment on the Nation: An Iowa Soldier Endures the Civil War (Kent State, 2012). He is currently working on an exploration of Walt Disney and Civil War Memory. His work has been supported by numerous fellowships, including a Mellon Fellowship from the Huntington Library, two Mellon Fellowships from Virginia Historical Society, a Ballard Breaux Fellowship from the Filson in Louisville, and the Reynolds fellowship from the University of Alabama at Birmingham. Miller is an active member of several historical organizations, including the Southern Historical Association and the Society of Civil War Historians. When he is not writing, Miller enjoys running, as he is attempting to run a half marathon in all 50 states (and DC). He has completed 21 so far, most recently in Whitefish, Montana.